Treatment for appendix cancer can be trying. The surgery has been nicknamed the MOAS (mother of all surgeries) as depending on how many cancer affected organs and tissues are removed, it can be the equivalent of several “major surgeries”. You can do a lot to help yourself recover from treatment. Because it is such a big surgery, about 25% of patients have some sort of complication. Complications can include pneumonia, blood clots in the legs that can travel to the lungs (deep vein thrombosis and pulmonary embolis), ileus (bowels stop moving), bedsores, poor wound healing. I have list of complications on my webiste at Surgical Treatment of Appendix Cancer. The average hospital stay is 2 weeks, but it can be up to a month with complications. But there is much you can do to avoid complications from the MOAS surgery. I was told I would be in the hospital for two weeks, but I was discharged in only 6 days! I walked 3 miles 8 days after my surgery! I was back to driving my car and doing all things normal (except for heavy lifting) 2 weeks after my surgery. How did I do that? It’s because I was a nurse and knew how to help myself recover quickly. This is actually the worst way to recover from major surgery. Bodies aren’t meant to be lying still all day and not moving! I knew that, so beginning the first day after my surgery, I decided to stay out of bed except to sleep at night. I was either up in a chair or walking the halls all day long starting the first day after my surgery. I didn’t wear hospital clothes, I brought street clothes and wore leggings or sweat pants (need the elastic waist) with blouses or sweaters starting the day after my surgery. You don’t HAVE to wear hospital gowns except to surgery! I only put on pajamas at night. It did hurt to start walking right away, and I couldn’t stand up straight the first few days I walked, but it was okay. They had a piano, so I could walk there and play the piano some days. My husband and I also went to the recreation room to play games during the day starting the second day after surgery. Blood clots in the legs that travel to the lungs can be a very serious complication, even fatal. This can occur from blood pooling in the legs if you lay in bed. Walking helps prevent these clots. Being up walking also helps you to expand your lungs, preventing pneumonia. Your bowels move as much as you do, so walking can help your bowels start working again after surgery and prevents an ileus, a common complication. Wounds also heal faster when you are up and about. Yes, you will be uncomfortable, and yes, it will hurt, but you need to stay out of bed. Ask for an abdominal binder, a wide elastic belt that supports your abdomen. I used one and it really reduced the pain of moving (though they didn’t give it to me in the hospital, I bought one at Walgreen the day after I was discharged). You can ask someone to buy you one at a drug store if the hospital doesn’t have one. I also didn’t use any narcotics for pain. Narcotics can make you sleepy so you won’t want to walk as much, and they can also slow your bowels and depress your breathing, helping cause the complications of pneumonia and ileus. I knew of a drug for pain that was NOT a narcotic called Toradol. Initially when I woke up from surgery they had me on a morphine drip, I asked them to get remove it. Toradol is an IV anti-inflammatory, kind of like a very strong IV Motrin, It worked much better for my abdominal pain than the morphine drip had. It can only be used for 5 days, so after that I was given 800mg of Motrin (ibuprophen) by mouth every 8 hours. My pain was well controlled without narcotics. The IV chemo in my abdomen caused no side effects or symptoms at all. I did do IV chemo for 7 months (I was told not for the cancer in my abdomen but in case any cells escaped from my abdomen and were trying to go to other parts of my body. I lived a normal life on IV chemo. I told my doctor and chemo nurses any side effects I had, and they gave me medications so that I did not have those side effects again. I even did athletic training while I was on chemo. 6 months after I finished chemo I did my first bicycle century, I rode 100 miles in one day. I think a lot of how you recover is mental. You can decide to feel badly for yourself and to not do anything that will make you uncomfortable and to stay in bed a lot “getting well” and “recovering”. But the best thing you can do for your recovery, to make if faster and without complications, is to MOVE as much as possible!!! Cancer can make us feel out of control. One day we are living and doing fine and planning for the future, the next day we are told we may have no future. We may lose everyone and everything we love. Our spouse, our children, our family, our friends. We may lose our job, our home, , all of the plans we had for the future. All at once we contemplate what we stand to lose. We try to be positive and to FIGHT (by the way, staying positive is not really always possible and has nothing to do with survival). We no longer feel in control of our life. But one day we finish chemotherapy, our surgery is over and all of our therapies we were using to fight cancer are gone. I know the rest of the world thinks you’ll want to celebrate when you finish treatment, but I know I personally felt like I had just lost all of the tools I’d had to fight. If a cancer cell had survived it could grow and cause a recurrence and I would no longer be cancer free. Another thing made me feel out of control, they now never call cancer cured, we are all, even myself 16 years cancer free, just in remission. Kind of like we are supposed to be waiting as the cancer might recur again? We can never really say it’s over and move on if we are never cured (but I have). Luckily I’m a medical professional, so base my choices on what is proven in research, but I think many are just looking for anything that might work to prevent their cancer from coming back, research based or not. I think cancer survivors just want a sense of control. Just this blog has gotten five spam comments (which I deleted) about some or another syrup that will cure everything from herpes to cancer. If you look up cancer diets online, you’ll find tons of pages, food you should eat, foods you shouldn’t eat, diets you need to follow. Sugar feeds cancer etc. etc. I know cancer patients who have sworn the use of raw diets, eating only raw fruits and vegetables will keep the cancer from coming back. I’ve been asked what changes I made to my diet…I MUST have to have survived signet ring so long! I tell people I never changed my diet at all. When I lost weight from my surgery, I ate lots of junk food and sweets to gain the weight back. I never stopped eating sweets or fast food or junk food, not that I eat a lot of it. I do believe it is good to eat more fruits and vegetables so,try to do that..sometimes. There are three kinds of cancer treatments, traditional; the surgery, chemo and radiation. The complementary, things done in addition to traditional therapy, and alternative, things done in place of traditional therapy. If you wonder if a particular cancer therapy or treatment of miracle cure is really a good thing based on research, type the name into a search engine and add + NIH (National Institute of Health). These are everywhere on the internet. Before you try any of these, be sure to type the name in a search engine followed by “NIH”. You will be able to find if research supports these therapies, if not, stay away! Even be careful with complementary therapies. I was rather depressed about my cancer and thought of taking an herbal remedy, St. John’s Wort. I read about it, and it turned out that if I had taken it, it would have interacted with my chemotherapy and made it 40% less effective. So I know the need to feel in control, but be careful. You don’t want to cause yourself harm or even inconvenience doing something that doesn’t make a difference or could even jeopardize your chances of survival! I was a cancer patient fighting for my life. When I lived many years past my expected survival, I was able to again plan for my future. I was going to two universities at the same time, Purdue University for an advanced practice nursing degree, I wanted to become a Clinical Nurse Specialist. I wanted to become an Oncology Clinical Nurse Specialist, so while I was going to Purdue, I also enrolled in Loyola to get my Graduate Certificate in Oncology. I learned so much at Loyola, it was an excellent school. In learning about oncology, I learned that cancer is a very inteligent disease. this is why it cause so much death, why the disease is so difficult to control, to cure. Cancer is a genetic disease. This doesn’t mean we get it from the genes we get from our parents. Only a small amount of cancers, 5-10% are caused by genes we inherit. Most cancers don’t run in families. If you have a cancer like breast cancer that occurs in several people of every generation of a family, and they get it at a young age, then you may have the inherited type. Inherited cancers strike at an earlier age and are often more aggressive. If in every generation a few members get cancer, but they are different cancers, it probably is not related to genes that are inherited from parents, cancer is probably not “in your family”. Most cancer comes from genes that become altered, or mutated, as we grow and as we age. Actually, the number one risk factor for cancer is growing older. This graph shows how cancer rates rise as we age. The median age for a cancer diagnosis is 66. The median age at diagnosis is 61 years for breast cancer, 68 years for colorectal cancer, 70 years for lung cancer, and 66 years for prostate cancer. But some of us our diagnosed earlier, I was diagnosed 26 years before the median age. 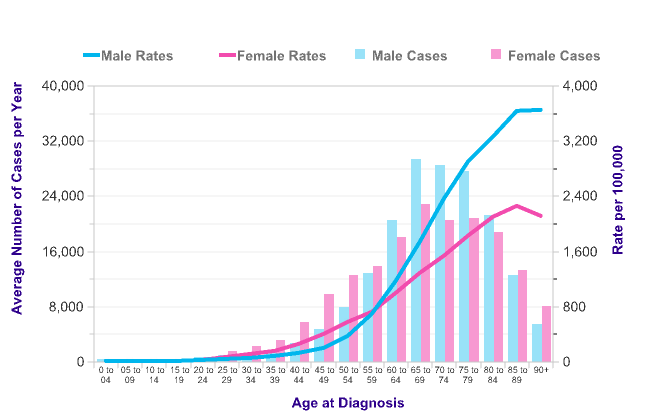 This graph shows cancer related to age. Normal cells have a definite life span, and after a certain number of times of dividing, they die, they don’t live forever. They are programmed to die. When they come into contact with other cells, or cells that are different from their organ, they stop growing, they don’t want to get in the way. They stay near the organ they are a part of. Every cell has a gene that protects it from cancer, the P53 gene. If the P53 gene notices that something is wrong with a cell’s genes, (a cell’s DNA), it makes that cell stop dividing until it repairs itself. If the cell can’t be repaired, it causes the cell to die. This protects us from cancer. Our normal cells and our normal genes are also very intelligent. Normally the immune system tries to kill cells that are abnormal, “foreign”, but cancer cells coat themselves to avoid our immune system. Cancer cells don’t respond to our body’s signal that tell a cell it is getting too close to another organ and to stop reproducing, cancer keeps growing enough to interfere with another organ’s function. They don’t need to stay near their organ of origin, like a normal cell, which is why lung cancer can grow in the bones and brain. When a cancer cell leaves it’s original organ, the lung or the colon, it also leaves its source of blood supply, its access to circulation, but cancer cells are able to trick the body into producing blood vessels that supply the tumor with oxygen to keep it alive. The abnormal genes in cancer cells keep mutating and the cancer keeps changing to outsmart our treatments, which is why a chemotherapy can initially be very effective against a cancer, then stops working; the mutated genes allow the cancer cell to become immune to the chemotherapy. Normally, cells respond to signals that tell them to stop growing or slow their growth. They respond to signals that tell them it is time to die. Cancer cells respond to none of these signals, they grow rapidly without stopping and never die. Our very intelligent bodies are overcome by a smarter disease. Chemotherapies try to target how cancer cells respond to the bodies signals, they try to make cancer cells behave normally and kill themselves. They try to stop cancerous tumor from creating their own blood supply. There is work trying to repair mutated P53 genes, if that happened, cancer rates might drop by 50%. It’s a tough battle. And it turns out that each cancer is it’s own disease, sometimes requiring a different treatment than every other cancer. Every cancer is different from another cancer so cancer can be considered 200 different diseases. To complicate it even more, one type of cancer, say lung cancer, might be genetically different in two lung cancer patients, so their might be 100 types of just lung cancer. Interesting, in one lung cancer clinical trial, 90% of the patients didn’t respond to the new chemotherapy, but 10% almost seemed to have their cancer cured!! The 10% that responded had different lung cancer genes than the 90% who didn’t respond, their cancers had mutated differently. While it would be wonderful to find just ONE treatment that cured ALL cancers, that is unlikely to happen. I think that people who are waiting for a cancer cure are waiting for the one big bullet that will cure all cancers, and that won’t likely happen. But wouldn’t it be great if it did? I there were one pill or one treatment that cured appendix cancer and lung cancer and colon cancer and leukemia? Let’s hope. Maybe one day there WILL be a cancer cure. I read a book once, “The View From Eighty”, written by Malcolm Cowley, born in 1898. He had turned eighty and wanted to tell everyone what it felt like to have lived for eight decades. He said he still felt 25 until he stood up and noticed his body didn’t work so well. He said death and disease were never fair at any age; if you were 25, you thought 50 was old and death and disability could be expected at that age. But when you were 50, fifty was young; potential death and disability were decades away at age 70… until, of course, you turned 70. So my eighty year old friend probably thinks cancer and death should still be decades away, at 100 years old. I had an interesting conversation with a man in his eighties diagnosed with lung cancer. He’d already lived a year with it, it’s a single small tumor that’s stayed the same size and even shrunk a bit with treatment. It hasn’t gone anywhere else. But he felt it was unfair that he had cancer, unfair it wasn’t going away with treatment, unfair that chemo made him tired. It was unfair he had lung cancer when he’d quit smoking many years ago. He was afraid of dying prematurely of cancer. He wanted me to reassure him he would be cured. But he got 40 more years than I did cancer-free. He got to finish his life, raise his kids, fulfill his commitments and travel before he had to deal with a cancer diagnosis. A cancer diagnosis while in your mid-eighties didn’t seem so unfair. I had to wrap my head around that a bit. Then I thought about it. Maybe some mother with a young child bald from chemo saw me at Sloan-Kettering at age 41. Maybe she thought how lucky I was to have lived for four decades. I’d made it to college graduation, marriage and had lived to get my first grey hair. I’d been able to have children. To her I’m sure I was the lucky one. She probably would have loved for her child to live to age 40. Maybe another mother would die before her kids were old enough to remember her. I guess there is never a right or good time or age for cancer.